Description of "The Crescent Moon"
The Crescent Moon is a collection of poems written by a girl living a city life of transition. The semi-autobiographical book revolves around the themes of love, happiness, daughter-hood, pain, loss and feminism. Where on one hand the hard hitting poems challenge the societal and patriarchal norms she was subjected to and witnessed, on the other hand, her soft love poems resonate with the hearts of the romantics. It is filled with the tenderness of a new girl's eyes and the fierceness of a young woman's heart. The book is a reflection of life as she saw it. As an internal battle takes place between her morals and desires, she seeks to take refuge in the proximity of what she knows best: poems. "And as I let my secrets out in front of the night sky, I saw the stars were winking at each other, as if teasing that they'll let my secrets out, the leaves were whispering my stories too loud, and the nightingale started singing of my laments. I blushed and glared at them, wishing them to stop being so obvious. I had almost given up on my comfortable confidence in the night when I looked at moon. The lone, crescent moon who all but silently smiled at me, as if telling me that she and I had a lot in common. I couldn't help but mirror her knowing grin as she urged me on to tell her more. And then, to her I poured my heart out." Aishwarya Ruchi Srivastava is a first time author who is a student in the University of Lucknow in Uttar Pradesh, India. She studies psychology and math but her heart only belongs to literature. That is why you will often find her sitting at the back bench scribbling little rhymes that make sense to her. One day she dreams of becoming an established poet and have her words resonate all across the globe. 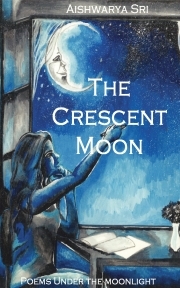 Reviews of "The Crescent Moon"